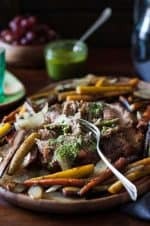 This Paleo pork roast slow cooker recipe with a sugar-free chimichurri sauce recipe is so wonderful my husband drinks it. Seriously! Last night I was making a pastured pork roast for dinner and I think it’s wonderful by itself. It’s sooo much better than regular pork and so much healthier. But I was in the mood to put a sauce on it but my husband doesn’t eat any sugar, even honey, because of his Type II Diabetes so I didn’t think the regular accompaniment of BBQ sauce would be good. Then I remembered that I’ve made this Chimichurri sauce before. My husband loved it. I mean, really loved it. He wanted to drink it. This is a highly unusual response from my husband. 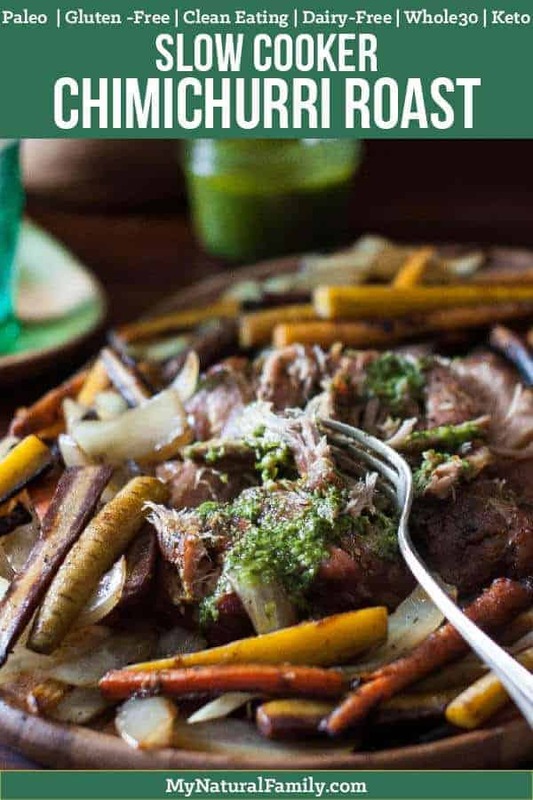 So next time you are making paleo pork roast, try this recipe for Chimichurri sauce to go with it. 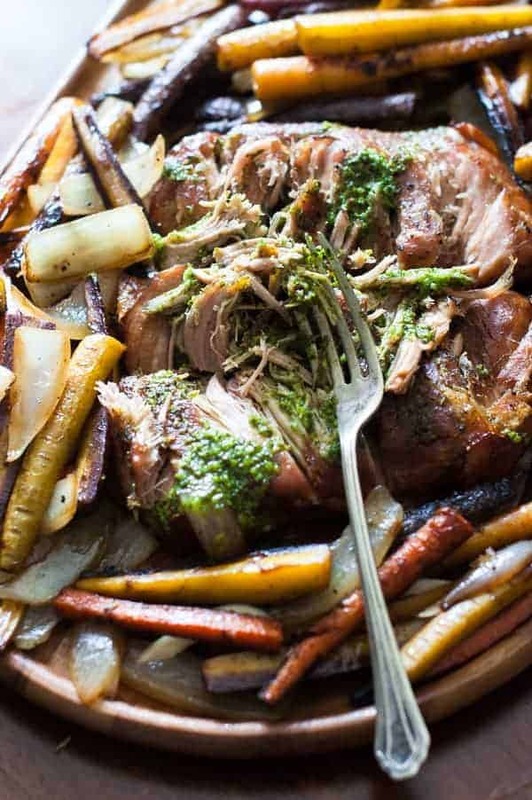 The Chimichurri sauce makes this Paleo pork roast slow cooker better than ever. Have you tried pastured pork before? I’m spoiled where I live because I live close to Real Foods Market, which is like the Mecca of pastured beef, pork, raw milk and the best free range eggs ever! They are also the owners of Real Salt and Redmond Clay. If you eat Paleo and you have not stopped eating regular salt, you really need to research Real Salt and consider it because the crappy salt from the store (even sea salt) is not the same stuff they had in the Paleolithic Age. Regular salt is processed and has a lot of unhealthy additives. Real Salt tastes awesome and only has good stuff. It’s actually healthy for you, unlike regular salt, which is very not healthy for you. I’ve made this Paleo pork roast slow cooker for our family so many times and the whole family loves it. My husband and I love tons of the sauce poured over it. It’s nice for a change to have something that tastes so good that we can have as much as we want since it doesn’t have sugar of any kind in it. I also love using the crockpot and the leftovers for this pork roast are really, really good and versatile. You can eat the roast plain, with BBQ sauce, on a sandwich, on a salad or you can bake it and make it crispy, kind of like bacon. paleo pork roast slow cooker Recipe with a Sugar Free Sauce – Chimichurri! This is a slow cooked pot roast with a savory Chimichurri Sauce. Have a great meal the whole family can enjoy! Place the pork roast in a crock pot. Drizzle 2 tablespoons of the olive oil over the roast and sprinkle it with salt and pepper. Cover with the lid and cook it on high for 6 hours (or low for 12 hours). After the roast has been in the crock pot for 4 hours (8 hours on low), add the onions and carrots to the crock pot, placing around the roast (Alternatively, you can pan fry the onions and carrots with the remaining 2 tablespoons of olive oil and saute them on medium/high heat until they begin to caramelize. Add them to the crock pot after this step). Cook the roast, carrots, and onions for 2 more hours (4 hours on low), or until the pork is pulls apart easily and carrots are soft. 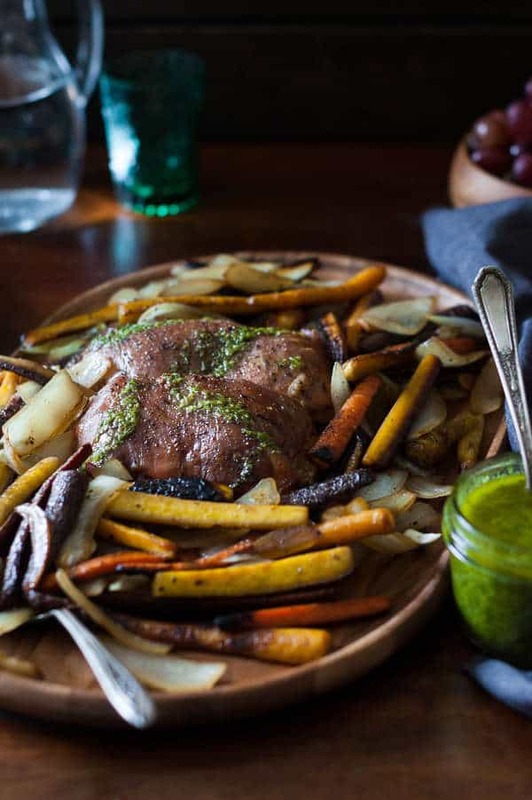 Place the roast, carrots, and onions on a serving platter and drizzle with chimichurri sauce. Serve with extra sauce. Please see the chimichurri sauce for nutrition information for the sauce. I hope you love this Paleo pork roast slow cooker recipe as much as I do. Our whole family loves this recipe! Heartily recommend! This looks perfect for our keto diet! Is the nutrition information for the roast as well as the chimichurri sauce or just the roast? This roast looks amazing! I will eat chimichurri on everything! No kidding! We all love it around here. where is the chimmchuri recipe? Making this tomorrow. It says cook time is 12 hours but I’m only counting 8 in the recipe. 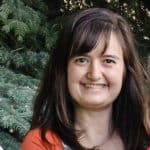 Tell me what I’m missing! Thanks! Oops. The 12 hours was just totally wrong. I fixed it now. Thanks for asking so I could fix it for other people. I didn’t add any liquids when I put the roast in. I’ve never made roast…do I just shred the meat in the juice or toss the juice since we have the chimichuri sauce? Yes so you just dispose of the juice and shred the roast. The juice to soak in the flavor while it is cooking. Do you slow cook it just with that salt and then add the sauce when you serve it? Thanks! I love pot roast – can’t wait to try this recipe!